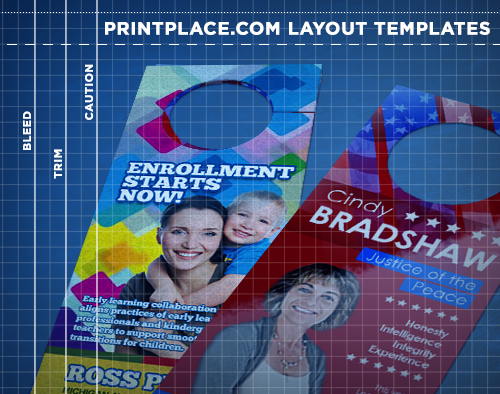 Use door hanger layout templates to create your artwork with the precise dimensions to print perfectly. You can verify the front and back of your door hanger as well as the placement and dimensions of the hole to be cut. This will save you from making corrections and possible delays in printing later. Download a layout template for Illustrator or Photoshop. 1. Pay attention to the safe area, cut and bleed area to make sure your door hanger designs don't get cut out. 2. Make sure your headlines are clear and easy to read, as well as adding your logo for branding and your contact information. 3. Using bold, vivid colors can help get the attention of potential customers.